Apple's new full size store in the St. Louis Galleria may be the first to feature a Wi-Fi lounge, according to ifoAppleStore. 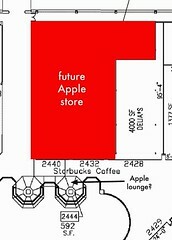 There are reports that Apple will occupy a kiosk that is being vacated by Starbucks in front of the store. Sources also say the new store will be the largest mall-based Apple store in the country when it’s finished, appropriate for the store’s financial performance of four times average store revenues. According to mall observers, Starbucks is soon moving its coffee sales operation to the second floor, outside the entrance to the Nordstrom store that opens in September 2011. Apple will then reportedly occupy the 592 square-feet permanent kiosk as a Genius Bar check-in space, Wi-Fi lounge and/or training space. The store will be over 6,000 square-feet in size with a 55-foot wide storefront.